The previous LG ticket thread seems to have been deleted accidentally. Please use this one instead. All ticket-related posts -- tickets for sale, tickets wanted, free tickets for LG mods, etc., belong here please. You may use this thread, in essence, as a classifieds section in listing the availability of tickets, but do not negotiate within the thread itself. Standard disclaimer: Buy or sell at your own risk. LG neither warrants nor endorses any transactions that result from posts in this thread. Where are all the tickets at? When do playoff tickets go on sale? and what is the likely hood of getting tickets for them if you aren't a season ticket holder? I've been selling my season seats on LG for 5 years. Looking for lower level tickets to either one of these games, FACE VALUE or below. Face value for those seats is $155. Does it come with parking? $175 isn't a bad price. If it comes with parking, it's a great price. I just got back from Japan and a deployment to Iraq. I have been there for 4 years. 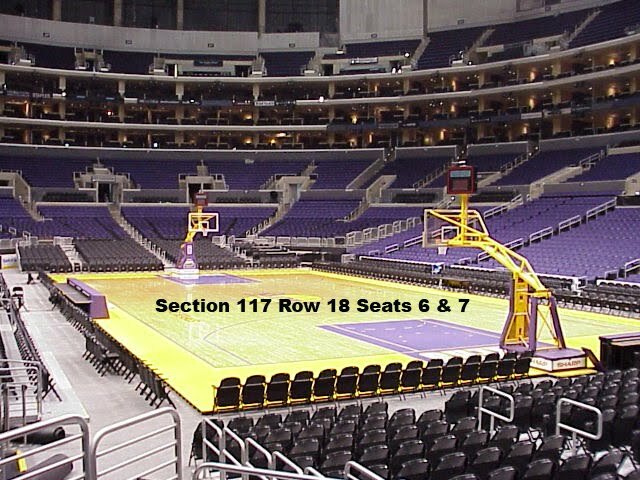 I want to go to the lakers vs denver this Thursday. However i have no idea where the best seats are and how much parking cost. Can someone offer suggestions on where and what to do? I'am living in 29 Palms CA. let me just say that i think we are all grateful for your contribution to our freedom! Found a set how good is section 107 row 10? i just checked and there is one ticket available for home game 3 in pr9 on ticketmaster....get at it guys! where , i cant find it? 1 ticket and look for the ticket? Posted: Wed Apr 08, 2009 7:18 pm Post subject: do any season ticket holders wanna share what this years playoff tickets look like??? cmon, anyone wanna upload a pic he he. . last year's playoff tickets had awesome artwork on them.